Background: There is a substantial amount of pasture in Ontario that can provide nesting habitat for Bobolink, a threatened species in Ontario and Canada. However, grazing livestock can negatively impact nesting birds in pastures by (1) making vegetation shorter than Bobolink need so the birds won’t nest in a particular field, (2) making nests more visible and vulnerable to nest predators, and (3) crushing eggs or young by stepping or laying on nests. 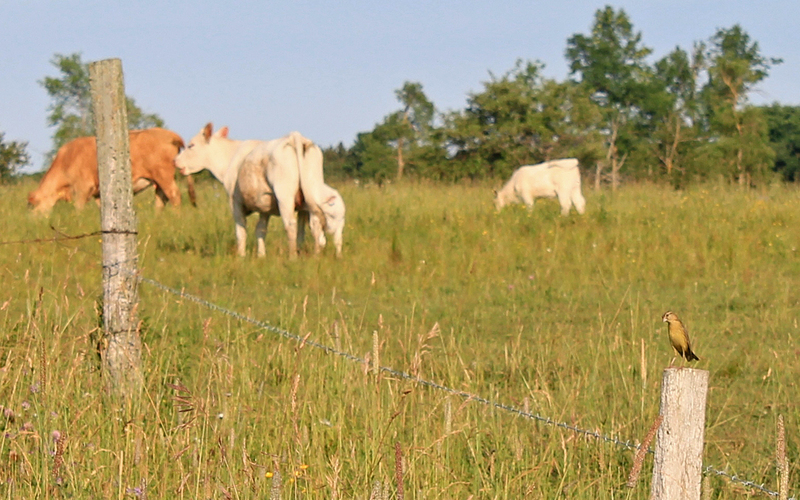 Project work: In collaboration with the Ontario Soil and Crop Improvement Association and beef farmers in the Ottawa Valley, we investigated how rotational grazing can be modified to benefit nesting Bobolink. In this 2-year project, we evaluated if small Bobolink refuges that are left un-grazed during the nesting season (May through mid-July) are an effective conservation strategy. We collected data on cattle movements and Bobolink nesting success on six rotationally-grazed pastures. Small Bobolink refuges (~3 hectares each) provided areas where Bobolink nest success was substantially higher compared to when these areas were grazed during the nesting season in the other year of our experiment. We also found that paddocks (fenced sub-sections of pasture) grazed less intensively than normal can provide successful nesting areas for Bobolink, under particular conditions. Conservation implications: Overall, our results suggest that paddocks on rotationally-grazed beef cattle farms that are un-grazed until Bobolink finish breeding or grazed lightly soon after Bobolink begin nesting can provide areas that enable the birds to fledge young from nests. Future research on the ecological response of nesting Bobolink to grazing pressure and the timing of grazing is needed to clarify best management practices on farms that can benefit Bobolink. This project was a collaboration with the Ontario Soil and Crop Improvement Association. Funding: Support for this project was provided by the Species at Risk Partnerships on Agricultural Lands (SARPAL) program, an Environment and Climate Change Canada initiative; Echo Foundation; the CICan Clean Tech Internships program; and individual donors. This video, produced in the fall of 2016, provides a snapshot of the first year of our research.